The public inquiry into the death of Victoria Climbie has been hearing evidence from the ambulance driver who took her to hospital the night before she died. Henry Teodorski said the eight-year-old was in such a weakened state that he thought she was already dead. He told the inquiry he had noticed scars on her forearm and detected a strong smell of bleach about her when he picked her up outside Chase Farm ambulance station in Enfield, north London. 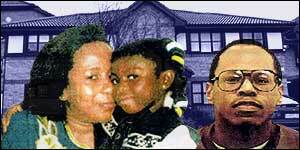 Victoria had 128 separate injuries on her body when she died in Tottenham, north London, in February last year. Mr Teodorski told the hearing that Victoria's clothes had been "dirty and insufficient for the time of year". He added: "She appeared very thin and was light and cold and unconscious. "She appeared much smaller than a normal girl of eight-years-old. Mr Teodorski continued: "Her skin felt cold and clammy. She had a very slow pulse and was not responding to speech or pain. He described how although Kouao had kept saying: "My baby, my baby", her concern seemed "not quite enough". And he said Manning had seemed to be "totally detached from the situation" and "looked more like a bystander than someone actually involved". "It was not the normal reaction I would expect from anxious parents," he added. When Victoria was admitted to the emergency care department of North Middlesex Hospital, Kouao told staff that she was incontinent, prone to injuring herself and had rubbed bleach into her skin. But she later said that Victoria was possessed by evil spirits and they were taking her to a church to be exorcised. Mr Teodorski told the inquiry that Kouao had seemed "frustrated or fed-up" and "more concerned about her own distress" while Manning behaved "almost as if he was not there". He concluded: "Nothing seemed to add up about their story." Earlier the hearing was temporarily adjourned after Victoria's father, Francis, broke down in tears as he was shown a photograph of the horrific injuries that preceded her death. The youngster's parents from the Ivory Coast had sent her to live with Kouao in England in hope for a better life. Instead she was starved, beaten with coat hangers, bicycle chains, bound naked and made to sleep in a bath in a freezing bathroom.